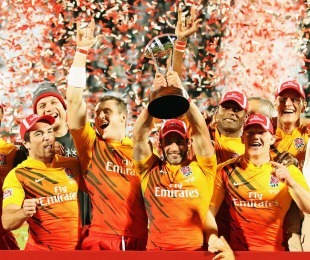 England claimed the season-opening Dubai Sevens with a thrilling 29-21 victory over the reigning IRB World Sevens Series champions Samoa on Saturday evening. After suffering a first ever defeat to Portugal, England had only scraped into the last eight of the Cup thanks to a last-gasp victory over Fiji in their final pool game on Friday. However, they were in scintillating form on Saturday, edging out Australia 24-21 before stunning Commonwealth Games titleholders New Zealand 19-14 to reach the final. Samoa went into the decider as favourites but England started strongly, with Oliver Lindsay-Hague crossing after just over 60 seconds of play. The Samoans hit back through Simaika Mikaele and Ofisa Treviranus but Lindsay-Hague dotted again in the dying seconds of the opening period to leave the game delicately poised at the break. Samoa pulled nine points clear in the second period thanks to a touchdown from Alafoti Fa'osiliva but England did not waver and finished in sensational fashion, with Simon Hunt, Dan Norton and Mat Turner all crossing in the final three minutes to claim a memorable victory. "We've got to remain pretty humble," insisted England coach Ben Ryan. "We've won one tournament at the beginning of the year but everyone will regroup and try and have a crack at us next weekend. The proof will be in how we run out in George next weekend." Captain Ben Gollings, who took his world record sevens points tally to 2,418 in Dubai, added, "The boys have been sensational this weekend and you can't ask for any more from them. It was always going to take one win to help us realise our true potential and hopefully we can really roll on from here. "I've experienced plenty of highs and lows but we really had to look hard at ourselves pretty seriously after the performance against Portugal but at the end of the day the boys did what you have to do in this game and that's to bounce back positively and make amends." Player of the Tournament, James Rodwell commented, "The whole team has put in a fantastic effort coming back from the loss against Portugal. I can't put my finger on why that happened. We didn't start as we wanted to against France and Portugal but we kept our patience today. After the Portugal game we were gutted. We have great support here in the crowd and it's incredible running out to that reception but we just didn't do them justice in the France game and the Portugal game." Elsewhere, Wales bowed out in the quarter-finals of the Cup after a comprehensive 35-7 defeat by New Zealand before then losing 26-12 to Australia in the Plate semi-finals. Scotland, meanwhile, reached the last four of the Bowl competition thanks to a nailbiting 28-22 victory over France but their hopes of silverware were dashed by a 28-17 defeat by Zimbabwe. The aforementioned Aussies went on to lose 19-12 to South Africa in the Plate final, with Cecil Afrika bagging a hat-trick for the Boks. Argentina claimed the Bowl by routing Zimbabwe 21-0, while Kenya had a similarly easy time of it in the Shield final, the Africans hammering France 26-0.